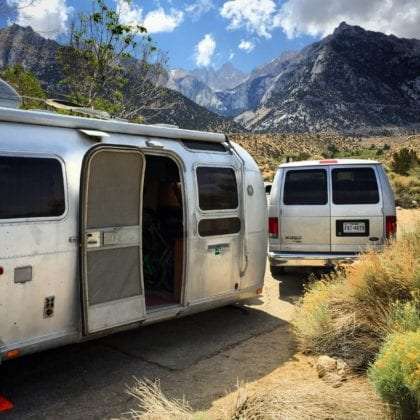 The campgrounds, weather and daily living off a family exploring the Owens Valley, the Eastern Sierras, and especially Mt. Whitney. How she towers above, beautiful, silver Mt. Whitney and her cohorts, casting their dusky shadow down every evening over all of us trying to be happy campers as we weather her mood swings. Frying pan hot sunshine days give way to spinning wheel winds. The babble of a creek, seemingly ever present. The small town of Lone Pine never quite bustling below. In the Alabama Hills, piles of rock which refused to wash away after millions of years of water’s wear and tear to form the Owens Valley, stacked like rubble statues, a tribute to what can disappear and what will simply not. Children climb the rocks, lizards and tiny cacti find safety in their shade. A red tailed hawk explores the buffet of it all. Lone Pine Campground, an Airstream family prepared an evening fire as the rain coming from Sequoia National Park dissipates into fog, stretching its fingers as far over these eastern leeward peaks as they’re allowed to do. Coulter pines boast their massive cones as transplant black locust only now, the middle of May, manage to begin budding and showing their summer leaves. Tent campers revel into the night their weekend parties. The hum of our generator working away at keeping our van warm enough for a few hours before we douse the fire and call it goodnight ourselves. As the week rolls in we move to another campground, Tuttle Creek, and things quiet down. I tear the heel from my boot scurrying on rocks with the younger boys and we all migrate into town to find a replacement. The bootsmith in town tells me he can’t resole the boot, due to it’s foreign nature. He shows me what footwear he has available. “This is the 881,” it’s a very high boot, something Sid Vicious might covet, black and all I can imagine is how difficult they would be to remove every night before bed. “Well here’s a solid Wolverine, this will last for years,” he tells me. “Will it take a long time to break in?” I ask. “Oh, yeah,” he’s short with words and seems slightly annoyed at our presence. Perhaps because he’s an older gentleman, a farmer type with wrinkles betraying his lifelong experience here in these Eastern Sierras. I ask to see a different boot. They’re all very expensive. “What kind of work do you do?” I presume he expects a reply such as rancher or steel worker. I only wear, or even own, one pair of shoes at a time. I’ve worn the soles out of a pair of Doc Martins in a year, the same the previous year. “Will they last long?” I ask. “Yes, if you take care of them.” He looks at my old boots, “How often did you oil those?” I laugh again, never having even heard of boot oil. Later, we ascend the Whitney Portal Road, steep, winding, and transporting us from the desert valley into fat red fir stands, the trunks of the big trees rivaling the sequoias themselves. The boys burst from the van and into the forest. Snowflakes are falling, many and chunky each one. They try and catch them in their hands, on their tongues. I study the giant ancients while the young ones frolic. A waterfall spills freezing water too fast to go icy behind us all. This is a dream world. Heat and snow are just a short drive apart. The sleepy town is cute, largely lacking in chain stores, and every waiter, every hardware store employee and passer by local in the street, smiles, inquired about our life. It’s a hard place to leave, but after a couple of weeks, it’s time to move on. We pack up the Airstream, hitch up, and head north.